Neoantigen selection is complex. 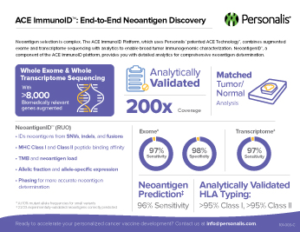 The ACE ImmunoID Platform, which uses Personalis’ patented ACE Technology™, combines augmented exome and transcriptome sequencing with analytics to enable broad tumor immunogenomic characterization. NeoantigenID™, a component of the ACE ImmunoID platform, provides you with detailed analytics for comprehensive neoantigen determination.